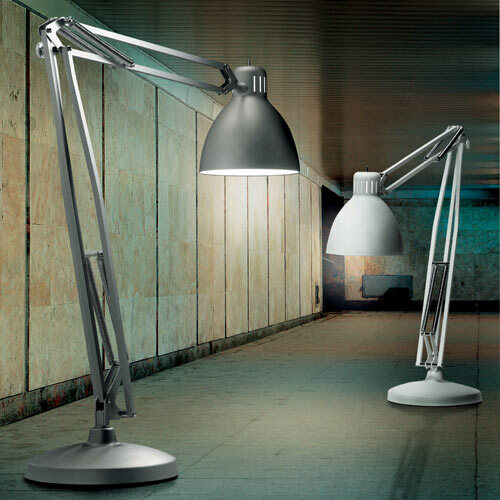 The extra large JJ floor lamp was styled after the famous Luxo Jr. Pixar-style floor lamp. Everything else dwarfs in proportion compared to this super-sized desk lamp. 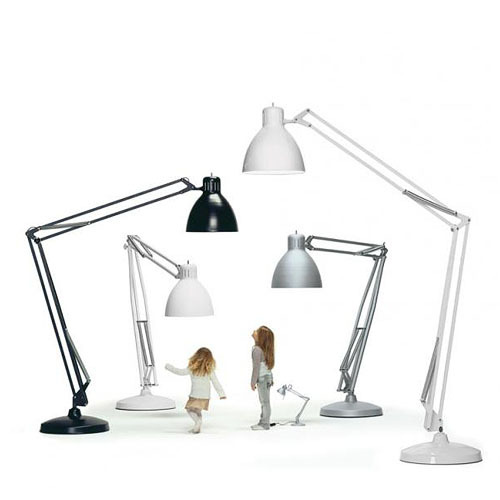 This huge oversized floor lamp is instantly recognizable since Pixar used a similar lamp in its animations. Norwegian designer Jac Jacobsen designed the first Luxo lamp in 1937. Today, the lamp is part of various exhibitions in museums around the world, as the lamp is being seen as an example for classic lamp design. In 1936 Jac Jacobsen received two crane-like spring balanced "monster" light fixtures included in a shipment of sewing machines from England. Although the technical invention comprising the light fixture's arm was ingenious, the lamp construction as a whole was primitive and had to be improved a great deal before being approved and presented to the market. He succeeded – and manufacturing started in Oslo in the autumn of 1937. He derived the name LUXO from Latin – "I give light". The amazing JJ extra large floor lamp is a modern take on this classic design. 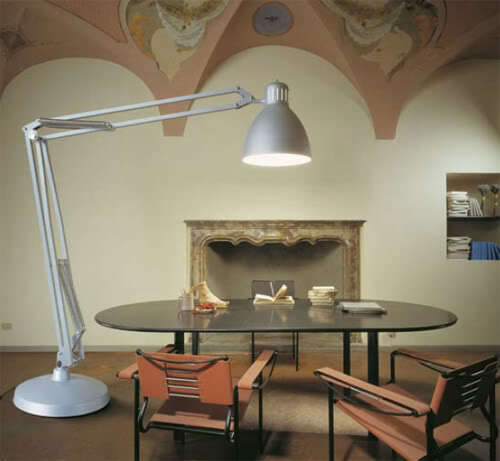 Larger than life, The Great JJ floor lamp is one of the most famous floor lamps of the last century. The Great JJ lamp was designed by Centre Stile design studio and is styled after the exact specifications of Jac Jacobsen's L-1 architect desk lamp, designed in 1937. 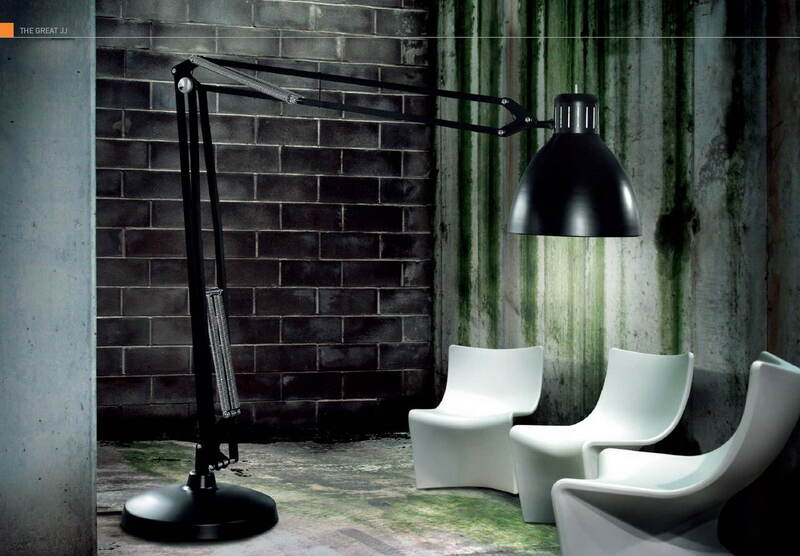 The Great JJ X-Large Floor Lamp features dramatic proportions for an entirely surreal aesthetic. This oversized floor lamp looks fantastic in a large living room, loft space or the office. It is composed of a highly adjustable armature, capable of stretching the design to an impressive height of almost 14 feet and features an aluminum diffuser which can rotate up to 105 degrees. In effect, it maintains the same functional adaptability as the original L-1 architect desk lamp, but adds a theatrical finesse through its imposing stature. Simultaneously classic and modern, you simply cannot go wrong with this iconic oversized floor lamp. The Great JJ floor lamp was designed by Centro Stile for the ITRE line, a part of the FDV Collection. 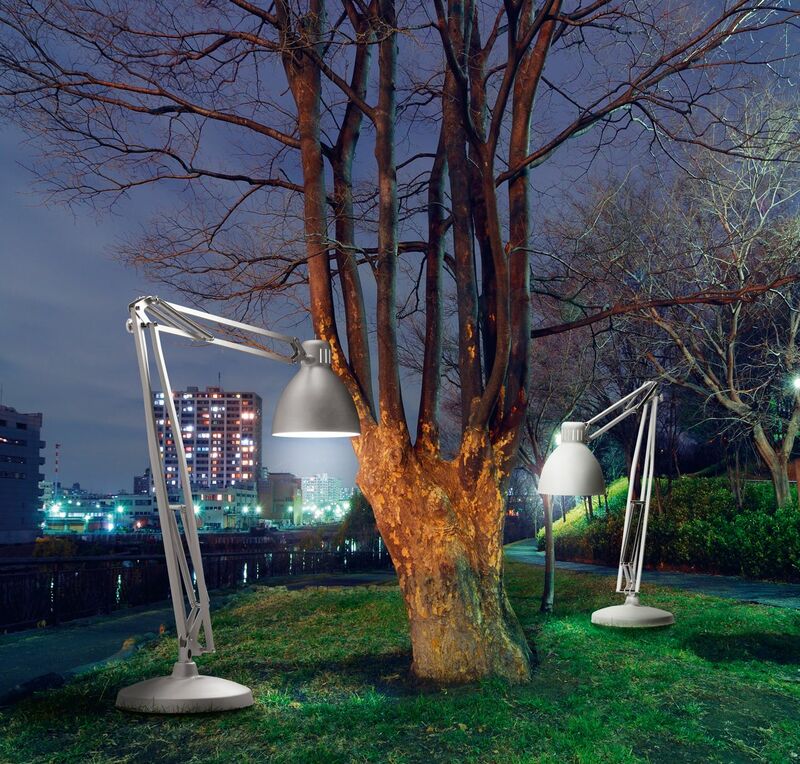 The Great JJ Floor Lamp takes the ordinary table lamp design to an extraordinary level. Made entirely of aluminum, this large floor lamp is available in two finishes and three colors. The floor lamp is a remarkably fully adjustable light. The sheer scale of the floor lamp can light up an entire room.